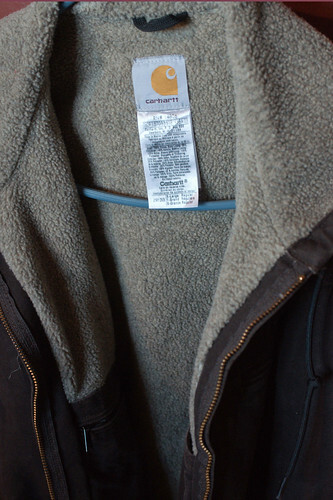 Almost every article of clothing you buy has a little brand label on it somewhere, whether stitched into the lining or on a little tag or elsewhere. This little piece of information lets you know what company is responsible for making this clothing item. I consider it a pretty useful piece of information when buying many of my items. Why? It’s not because I’m a “brand snob” or anything like that. I just simply know from my own experience that certain brands indicate items that have been well made and will hold up over a long period of time. These brands usually have certain standards as to what will go out the door with their logo on it. While some companies will put their name on anything, others know that there is real value in having standards for your product, and knowing some brands that have standards is worthwhile. I’m quite willing to pay a little more for an item if it’s going to last twice as long because my cost per use of that item will still be lower over the long run. I’m also not going to return to the store nearly as often, too, which also saves a bit of time and money. Take my Carhartt coat. Over the years, I’ve owned two Carhartt winter coats. I wore one of them for a few winters when I was a teenager. I passed it on to my nephew, who, after a few years, passed it on to his younger brother. The thing is still in pretty good shape, even after being worn on countless outdoor excursions over a dozen or so winters by teenage boys who enjoy hiking in the timber and other activities that could really add wear to it. My second Carhartt jacket was purchased when I was an adult. I’ve had it for almost ten years now and the thing looks almost exactly the same as when I bought it. The coat I had before that had stitching ripping out within two years. A jacket I received as a gift three years ago has two large holes in it already. Carhartt produces sturdy and reliable (and warm) winter coats, which is exactly what I want when I’m out sledding with my kids. Another example: a few years ago, I came across a sale on some very well-made t-shirts from Harbor Bay. The price was really low on them for the quality, so I purchased several. These things are indestructible. I’ve worn most of them dozens of times and none of them are showing any kind of significant wear. In the future, if I’m looking for t-shirts, I’ll look for a Harbor Bay sale. If I’m looking for a winter coat, I’ll look for a Carhartt sale. But why is this important? The math reveals the story. Let’s say I see a coat for sale for $30 from some brand I’ve never heard of. I also see a coat from Carhartt on sale for $50. I need a new winter coat. Which one do I buy? My experience tells me that the Carhartt coat will last for a dozen winters or so. My experience also tells me that buying a coat without knowing much about it will often result in an item with some significant problems after three or four winters. I don’t know this – it might be a very good and long lasting coat. Let’s be generous and say that on average, this unknown coat will last for five winters. For me, one of the key factors when buying a clothing item is how many times I’ll get to wear it before it becomes too worn. The higher that number, the lower the cost per wearing is going to be, and the lower the cost per wearing, the better the long-term bargain. Buy good items that last, even if you have to pay a little more. The brand can help in this process.